Ecstasy: an Alex Bernier mystery by Beth Saulnier is the fifth in this series about a Gen-x female reporter in upstate New York. This novel focuses on deadly deeds at an annual rock festival where teens are dying from tainted drugs. Ecstasy: an Alex Bernier mystery is set in Gabriel, a small college town in upstate New York. The novel opens with Alex Bernier, a reporter for the Gabriel Monitor, being sent to cover the Melting Rock Music Festival, the last surviving annual "Woodstock" clone rock festivals. Alex is not enthused about five days and four nights of sleeping in a tent, non-stop pounding bass, high hippies & hippie want-to-bes, and porta-potties. In the search for her six web stories and one newspaper story (per day) Alex meets and interviews "the Jaspersburg Eight." "The Jaspersburg Eight" are a group of eight local young people, aged 16 to18 years of age, who began attending the Melting Rock Music Festival as children. When three of the Jaspersburg Eight wind up dead from tainted LSD, Alex thinks it is not just a coincidence and decides to find out who wanted the teens dead before the group becomes the "Jaspersburg Zero". Meanwhile in the usual Saulnier plot complication, local residents are protest against Benson College. This time the residents are up in arms about a natural cooling facility that uses the cold water of the local deep lake. Needless to say more deaths surround this facility. Could there be a connection? The characters of this novel are as odd as the town in which they reside. Alex Bernier is a wise cracking Generation X reporter for a local newspaper. She is virtually being over-whelmed by her life and her assignments at the Monitor. Alex suspects that her boyfriend and Gabriel police officer, Brian Cody, is contemplating returning to his old beat in Boston causing her great emotional stress. Her job is no less stressful. Jake "Mad" Madison, the science reporter for the Monitor and Alex's sidekick, seems to have gone off on a serious drinking binge over Alex's former roommate, leaving him in a coma and her with his assignments. Also, Cal Ochoa, has joined the Monitor's staff. He is an eager beaver with eyes open for the perfect story that will lead to a position at the NY Times. Unfortunately, he is the spitting image of Alex's former (and very much deceased) boyfriend. While Alex is strong and brave, she is also humanly vulnerable. She jumps in feet and mouth first then realizing her serious error, tries to flee the scene. Ecstasy is not up to Saulnier's usual humorous level. Alex Bernier is not at her wise-cracking best and her shenanigans are few. This book seemed more somber than her earlier novels. That is not to say that it is not enjoyable, I really did enjoy the Woodstock-clone descriptions, but it is just not the norm. I am holding my full judgment until I read her next Alex Bernier book. 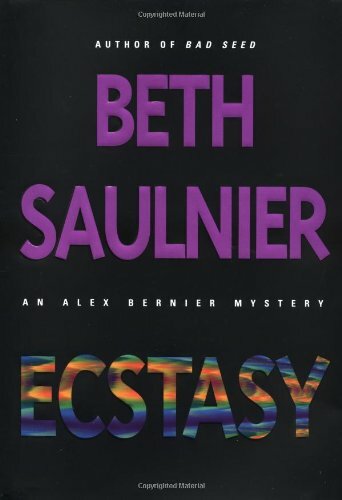 Ecstasy: an Alex Bernier mystery by Beth Saulnier is, in my opinion, her least enjoyable book of the series. The main character's sense of humor, and oddball predicaments are missing in this one. Still the book is definite keeper for me and I do still highly recommend the series.